At the beginning of 2017 I vowed that instead of always packing the same lunches day in and day out, I would try and be more creative with my mid-day meals. So far it has been smooth sailing. I've made a variety of sandwiches, soups and most recently a delicious egg salad. Contrary to popular belief, the health benefits of eggs are huge and include: improving your eye sight, keeping your skin healthy and reducing the risk of heart disease. 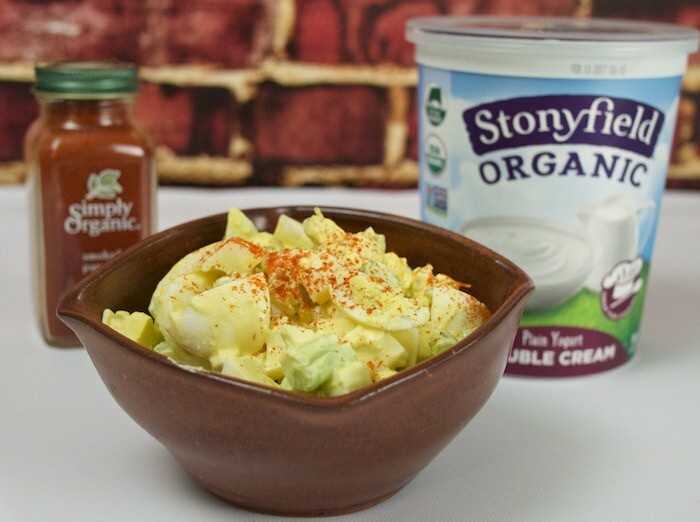 When you mix eggs with Stonyfield's new Double Cream yogurt & Simply Organic spices, two additional "good for you products," you have a healthy and tasty meal that can be ready in minutes. So what is this double cream yogurt I mentioned? It's a new yogurt product from Stonyfield that is thicker, richer and creamier than whole milk yogurts due to its higher fat content. Made specifically for cooking and baking, it can easily be substituted in most recipes calling for sour cream, buttermilk, or oil. I've had wonderful results adding it to pancake batter and cakes, among other things. For those that don't know Simply Organic Spices are all free of MSG, GMO’s, aspartame, and high fructose corn syrup, so you can feel good about using them in your favorite recipes. Coarsely chop the hard-boiled eggs. Add the Double Cream yogurt and season with salt and pepper. Add the paprika and stir to combine. Serve between bread or as a topping for crackers. Love the use of yogurt in this egg salad! Perfect with the addition of smoked paprika too! I have to look for this next time I run to the store! Sounds good. I am definitely looking for that yogurt! I love using Greek yogurt in my egg salad! YUM! I need to work on taking different lunches too! This looks so good! So simple and so good and that double cream yogurt sounds terrific, can't wait to try it! A great, quicky and yummy recipe indeed. Sometimes, I want to do something fun with the boiled eggs. Thanks for the idea. I've never made egg salad with yogurt before. I usually use sour cream instead of mayo, which is a bit odd, I know. I think your version will be delicious!